Will sacrificing a blocking creature before damage prevent trample and/or life link? How is trample damage assigned on a spitemare? I'm glad Runic caught your eye, and my bad on Packleader, he works much better in my jund deck because it's mostly big creatures. 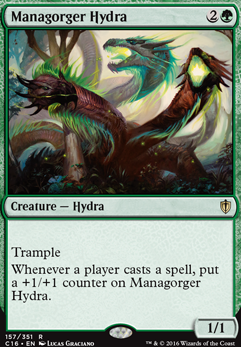 Managorger Hydra might be better than Gyrus for you, and at the very least you ought to sideboard that for 3+ player matches, because that always gets insane if he lives more than 3 turns. Here's my deck if you care to look at it: Vial-Ikra the Fierce Jund Deck I feel like it's similar to yours in that it's not super combo-y, but with a wildly different strategy. @PlatinumOne: I appreciate the feedback. I have been playing this deck for a couple of years now and can speak to your concerns. This deck is extremely consistent, and does not suffer from land issues for a couple of reasons. The 17 Lands in the list is the perfect number and array. 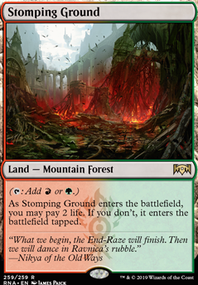 Firstly, establishing the correct array of lands is the most important step in the first three turns, which should ideally include a basic Forest , Swamp , and then a red source. 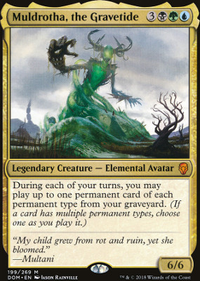 I use Traverse the Ulvenwald as needed to help establish my basics (after which I use them to fetch Bloodbraid Elf or Death's Shadow , laying my red source only if/when needed as it is a mana source that if destroyed, leaves me vulnerable. 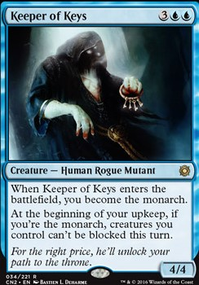 As I move through my mana curve, I have powerful 1 and 2 drops that establish early control over the board, namely hand destruction and goyfs. By the time I lay down my 3rd land, my opponent usually has nothing of value in hand, and/or my Tarmogoyf is too big for him to get through (though I might let some damage through to switch on Death's Shadow). Also, by turn 3, I know that I'll either go the Blood Moon route, which almost always locks the opponent out of the game, giving me all of the time that I need to do my thing and win, or go hard on the aggressive route with Death's Shadow and Bloodbraid Elf. This deck is finely tuned, and requires finesse, and does have a bit of a learning curve, and you definitely need to research/know the local meta to make best choices. Honestly, at one point I put in some Managorger Hydra s in place of Dark Confidant and it was just as consistent, and effective.